Climb or relax but enjoy the stunning limestone cliffs around Railay Beach that make it uniquely striking. 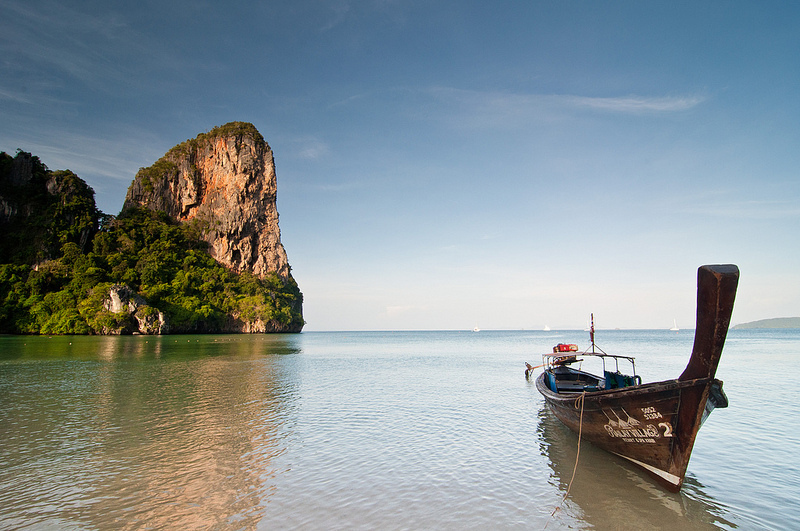 Read our guide to Railay Beach. Located on a peninsula just a short boat ride to the south of bustling Ao Nang, Railay is inaccessible by road or on foot. The only way to reach this stunning beach is to take a longtail boat from Ao Nang, which is located less than five minutes away. Railay Beach is famous for its fantastic rock climbing, but there’s much more than climbing to do here. From relaxing on the beach to snorkelling near some of Krabi’s best islands, Railay Beach offers a great selection of adventures and activities. Railay Beach is split into two different areas, both of which are walkable: the upmarket and beautiful Railay West, and the less aesthetically pleasing but more affordable Railay East. Stunningly beautiful, Railay West is the most popular side of Railay and the beach you’ll want to spend most of your time on. 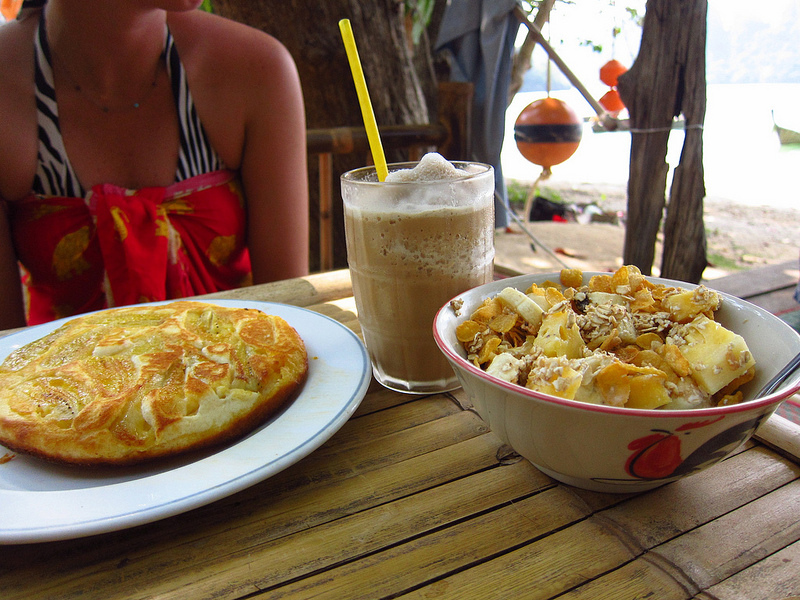 Beachfront restaurants and bars make Railay West the type of place you can easily spend an entire day. Railay East might not be as visually interesting as Railay West, with its beach almost entirely covered in mangroves and its water far from perfect, but it’s still a fun place to stay and home to most of Railay’s nightlife. Although Tonsai is technically a separate beach, it’s easy to access from Railay West. Due to Tonsai Beach’s proximity to the large limestone cliff faces that surround Railay Beach, it’s the best location in Railay for rock climbing. Known for its fertility cave, which is filled with wooden phallus statues, Phra Nang Beach is a short walk from Railay West. Phra Nang’s clear water and white sand makes it a less crowded alternative to Railay West, which can quickly fill up with people in high season. Use the search box below to find out departure times and prices on your selected travel dates to Railay. 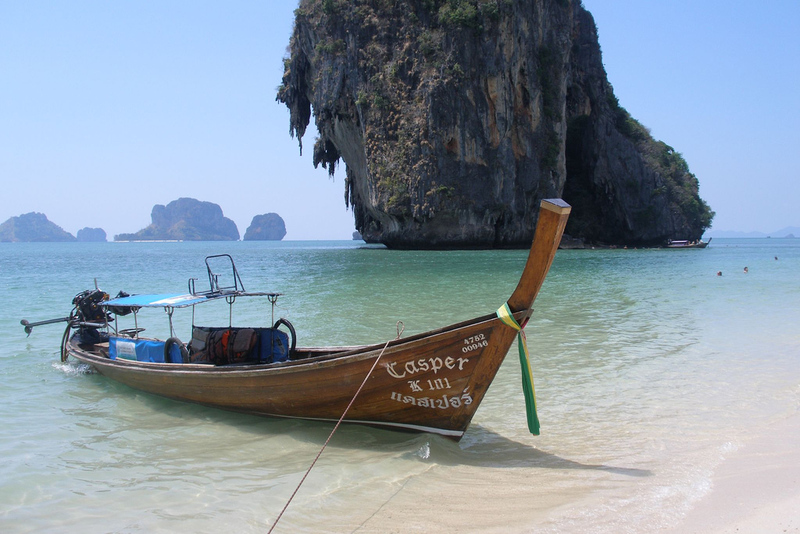 Unlike nearby Ao Nang, Railay Beach isn’t packed with attractions and things to do. The main attraction is the beach itself, which is one of the most impressive in Thailand. Swim in the light and clear water or work on your suntan from the beach. Tonsai Beach is one of Thailand’s most famous rock climbing destinations, boasting a great selection of climbing routes on giant limestone cliff faces. Climbing lessons are available for first-timers and experienced climbers alike. Renting a kayak is one of the best ways to see Railay and Phra Nang. Kayaks are available for rent on Railay West — ask one of the rental providers for tips on the best places to paddle to before you go. 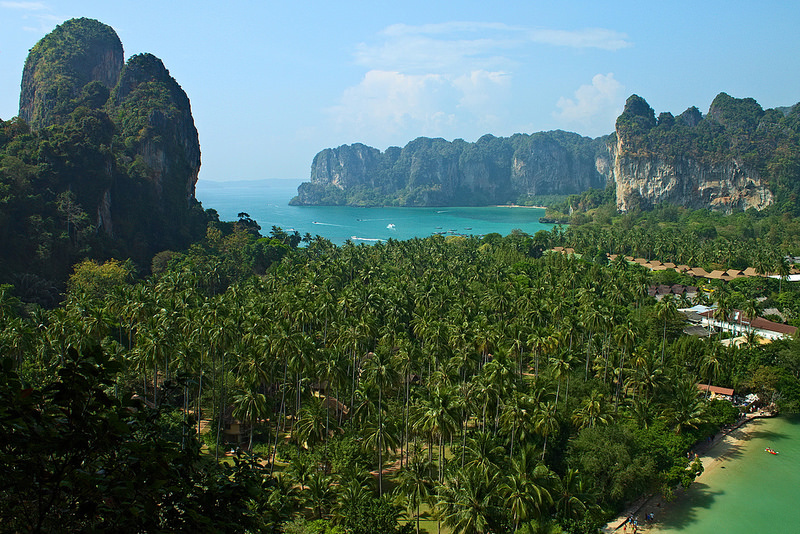 The climb to Railay Viewpoint is challenging, but the incredible view of Railay West and East makes it worth it. You’ll find the trail to Railay Viewpoint at the southern end of Railay East — make sure you’ve got a pair of closed toe shoes, as the climb isn’t as easy as you’d think. 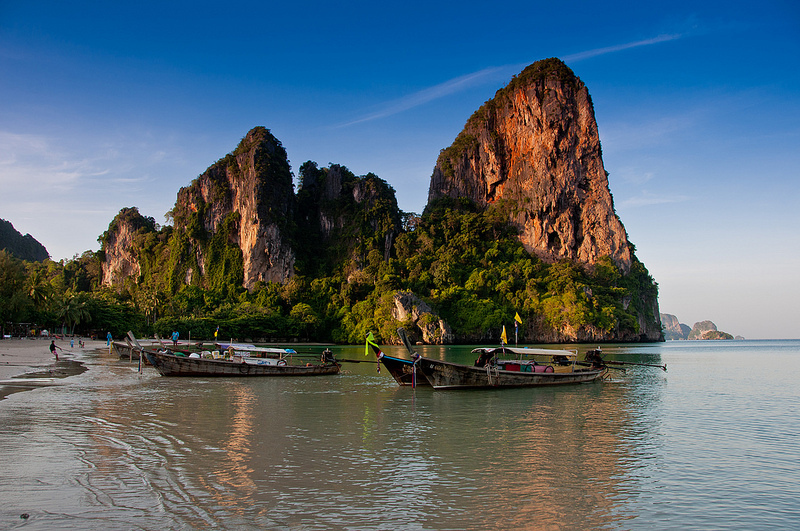 If you’re prepared for an even more challenging climb, try visiting Railay Lagoon. You’ll need a pair of running shoes to make it all the way down to the lagoon, as the trail involves several descents over rocks and challenging obstacles. While the snorkelling off Railay Beach itself is mediocre, there are several good snorkelling sites that you can access by boat. Snorkelling trips can be organised from Railay West and East, with several trips travelling daily from Railay to Krabi’s top snorkelling spots. Rayavadee Hotel is an ultra-luxurious resort on Phra Nang Beach. Pavilions and private villas are available, many of which include private outdoor jacuzzis and swimming pools. The resort provides easy access to Phra Nang Beach and Railay West. Bhu Nga Thani Resort and Spa offers a huge selection of rooms ranging from deluxe doubles to a private Presidential Villa. Rooms are spacious, sunny and modern. The resort includes a large outdoor swimming pool and luxurious spa. Spacious, comfortable rooms in a relaxing setting make Railay Village Resort a good choice for travellers seeking a luxurious but affordable hotel. Beachfront dining and easy access to Railay West make this a convenient place to stay. Located on a hill overlooking Railay East, Railay Great View Resort offers a fantastic view of Railay and a selection of cottages. The swimming pool and outdoor spa are great places for relaxing, although the nearby longtail boats can be a noisy annoyance at certain times. One of the few large resorts on Railay West, Railay Bay Resort and Spa offers a selection of cottages and pool villas with direct access to Railay Beach. Rooms are large and the hotel’s restaurant is located right on the beach, making this a convenient choice. Situated close to the limestone cliffs of Railay East, Railay Phutawan Resort offers a good choice of rooms, cottages and villas in a convenient location. Rooms are comfortable and tastefully furnished, although the hotel is quite a walk from Railay West. Railay Garden View Resort is located at the north end of Railay East. With a relaxing location far from the more developed parts of the beach and a selection of bamboo bungalows, it’s an affordable and convenient place to stay for travellers on a budget. Located halfway between Railay West and Railay East, Wan-A-Rouy serves a range of tasty Thai dishes at reasonable prices. A selection of freshly cooked seafood dishes are available each night. One of several restaurants located between Railay West and Railay East, Mangrove’s menu of Southern Thai dishes makes it a popular choice for travelers in Railay. Great pricing and a lengthy cocktail menu make this a good choice for dinner and drinks with friends. One of several bars in Railay East, The Last Bar serves cheap and tasty Thai food and drinks late into the night. Live music and a nightly fire show make this a fun place to relax after a day at the beach. Railay Beach is separated from Ao Nang by a rugged peninsula, making it impossible to get to the beach by road. Longtail boats depart from Ao Nang frequently — you’ll usually need to wait until the boat is full to get to Railay without paying a higher fare. 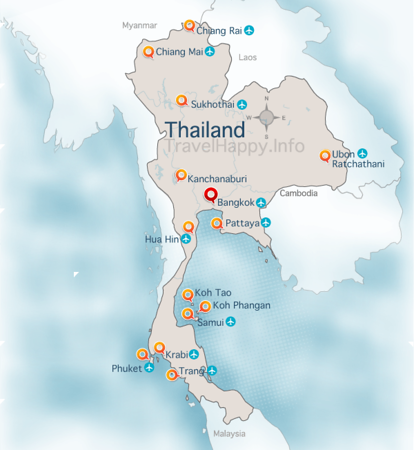 The nearest airport to Railay Beach is Krabi Airport. Check Skyscanner to compare airlines for the best prices and flight times to Railay Beach.